Should I Reface My Cabinets? If you’re looking for an affordable way to give your kitchen an up-to-date look, refacing your kitchen cabinets is the way to go. Refacing existing cabinets generally costs about half of what getting all new custom cabinets would, plus it can usually be done in a much shorter period of time. If you are happy with the way your kitchen is laid out currently, but tired of its worn or out of date appearance, you may want to consider cabinet refacing. But not all refacing jobs are equal. Giovanni Kitchens in Sterling Heights Michigan removes your existing doors and drawers, and reinforces your cabinet frames with our exclusive double lamination process. Thin wood substrate is first bonded to the visible cabinet surface before they are covered with the final layer of laminate or natural wood refacing materials, thus ensuring a permanent solution. You receive all new doors and drawers, as well as the hardware. If you need additional storage space or if one of your original cabinets is damaged, Giovanni Kitchens in Sterling Heights Michigan can create a matching custom cabinet to blend with your refaced cabinets to provide a coordinated look. Cabinet refacing will conserve the most precious resource of all–your money! Refacing is a second-to-none money saving option for your kitchen remodeling project. By preserving your existing cabinetry, you can save enough to truly create the kitchen you’ve been envisioning. Upgrade to a new luxury countertop. Add some storage accessories or decorative moldings. Go ahead..build in all of those bells and whistles you might have otherwise forgone due to budget concerns. Plus, you’ll feel great every time you walk into your newly refaced kitchen knowing that cabinet refacing is environmentally responsible. Cabinet refacing costs less and uses fewer resources. This eco-friendly, affordable alternative for remodeling your kitchen will keep your perfectly good cabinets out of the landfill. Find out how affordable refacing your kitchen can be! Call us today at 1-586-322-4260 to schedule an hour of FREE expert advice. You’ll be glad you did. Cabinet Refacing in Macomb Twp, Clinton Twp, Utica MI, Grosse Pointe, Rochester MI, Rochester Hills MI, Shelby Twp, Troy MI, Warren MI and beyond by Giovanni Kitchens. If you’re like many homeowners, you plan to keep the existing layout of your kitchen exactly the same. Cabinet refacing, also known in the industry as cabinet resurfacing, lets you keep your existing kitchen intact while completely transforming its appearance. As an added bonus, kitchen refacing reinforces the strength of your existing cabinets, providing even greater structural integrity for the years to come. In most cases, the cabinet refacing process is the superior choice to gutting your kitchen and installing all new cabinets. Not only will this save a lot of time and mess, but it will also save you about half the cost of new custom cabinets. Since your choice of new cabinet doors is included in the price, eighty percent of what everyone sees in your kitchen will be brand new. It just makes sense! To sum it all up, if your kitchen is well-built and functional there is no reason to tear it all apart. Even if you need more cabinet space, kitchen cabinet refacing can be combined with additional matching cabinetry that we build specifically for you, so that you can have a complete, fresh new look. Pantries, desks, extra cabinet units or even a free standing island can be custom made by our cabinet shop. Plus, you’ll be able to choose from hundreds of color and style combinations in both wood and laminate. 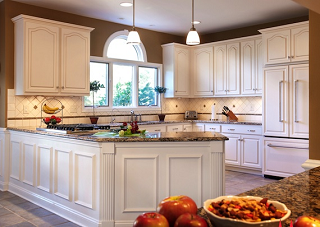 Cabinet Refacing in Michigan Gives Your Kitchen a Fresh New Look at an Affordable Price! What Does Cabinet Refacing Cost in Michigan? © Copyright 2019. Giovanni Kitchens – Kitchen Remodeling Sterling Heights, MI. All Rights Reserved.